American Eden - Description | W. W. Norton & Company Ltd. The untold story of Hamilton’s—and Burr’s—physician whose dream to build America’s first botanical garden inspired the young Republic. When Dr David Hosack tilled the America’s first botanical garden in the Manhattan soil more than two hundred years ago, he didn’t just dramatically alter the New York landscape; he left a monumental legacy of advocacy for public health and wide-ranging support for the sciences. A charismatic dreamer admired by the likes of Jefferson, Madison and Humboldt, and intimate friends with both Hamilton and Burr, the Columbia professor devoted his life to inspiring Americans to pursue medicine and botany with a rigour to rival Europe’s. Though he was shoulder-to-shoulder with the founding fathers Hosack and his story remain unknown. 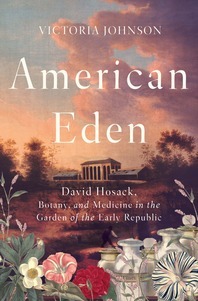 Now, in melodic prose, Victoria Johnson eloquently chronicles Hosack’s tireless career to reveal the breadth of his impact.